Designs by Lisa Somerville: Flourishes is Flourishing! 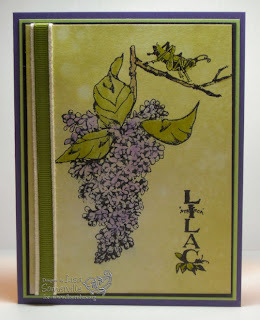 Flourishes adds Sharon Johnson as owner and releases two beautiful sets - read more here! The two new beautiful sets are Rock-a-Bye Baby and Lilac. Here's one of the cards I created using images from the Lilac set. I used the Spritz and Flick technique (TJNL) and Shabby Shutters Distress Ink to create the background. The images are stamped in black stazon, then colored using my aquapainter with Peeled Paint and Concord Grape Distress Inks. I stacked my artichoke grosgrain on my twill and wrapped it around my card. This panel is layered on black, celery and then my eggplant base. You are killing me with this set, now you just stop it! Beautiful work GF!! WOW, this card is beautiful, love all the background techniques and those Lilac's, love that grasshopper too. Excellent card. I'm off to check out Croppinsville.